How come the following code executes if buf* is @ rodata segment ? I think you mixed up segments and sections on ELF. Unlike PE where sections define how the application is mapped and page permissions, ELF loaders only use segments PT_LOAD to do that. Segments don't have name, so there's nothing like .rodata segment, only .rodata section. You can verify that be setting 0x0 to the field ElfN_Ehdr::e_shoff, it'll still work. 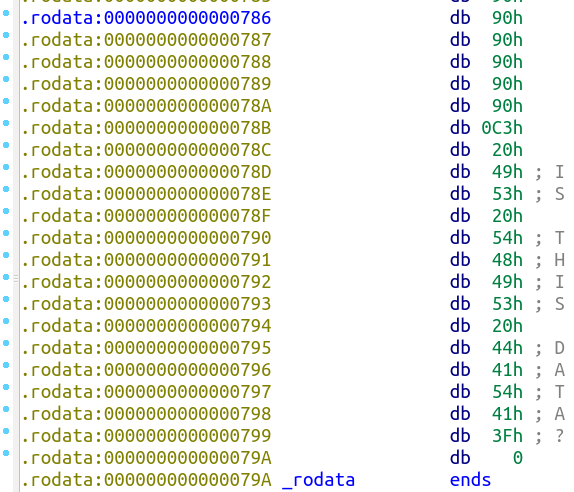 Now regarding the initial question, it seems ELF executable used to have only two PT_LOAD segments, one is R-X and RW-. If a data is const, it'll be stored inside the first segment which is also executable. It's not true anymore on my archlinux. Convert C to MIPS assembly code? Why does the C compiler generate integer multiplication with large, seemingly random, numbers?